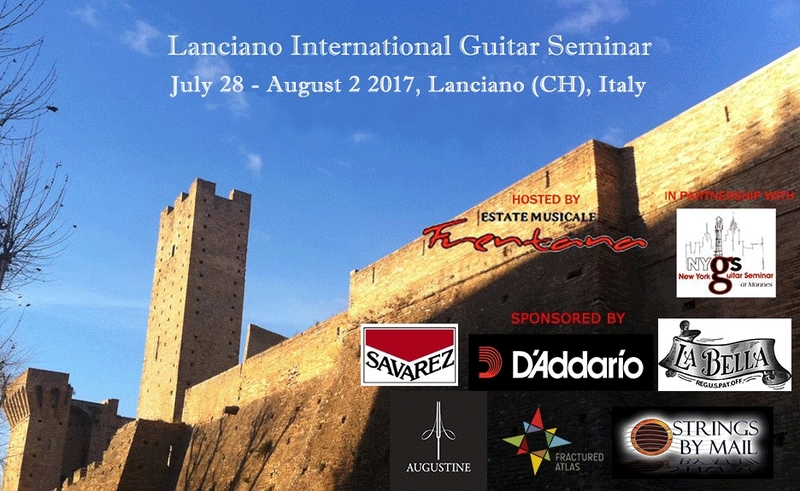 LANCIANO INTERNATIONAL GUITAR SEMINAR 2017 Edition. ARTISTIC MISSION: The mission of the Lanciano International Guitar Seminar is to promote high-level solo and ensemble/chamber music training for guitarists. Internationally renowned professionals will teach master classes for soloists and ensembles during the six days of the Seminar. A final concert featuring selected participants in solo and ensemble performances will conclude the event. The benefits of successful chamber music experiences are enormous, especially for instrumentalists who devote so much of their time and efforts to solo pursuits. Moreover, chamber music skills are necessary to be competitive in the music job market. A full-immersion guitar education week gives the opportunity to share new ideas, contacts and experiences. Also, it enhances the development of new collaborations. Another important goal of the Lanciano International Guitar Seminar is to promote international cultural exchanges between Italian and international guitarists and institutions. To boost the international exchange stature of this new endeavor, international students will receive a discount on the tuition fee. Moreover, two top participants will receive full scholarships ($575 value each) to the 2017 New York Guitar at Mannes College of Music (provided by the New York Guitar Seminar). And two or more other top participants will receive full scholarships to one of the master classes organized by the Estate Musicale Frentana in 2018. Guest Faculty : Francisco Bernier - Conservatorio Superior de Música in Seville. • Master Classes: Individual instruction (at least two for each participant). • Master Classes and Coaching: Ensembles (duos, trio, quartets, etc.). Full participants will receive an official paper for the Seminar attendance. Full participants will perform in the final participants concert. The Seminar Board reserves to cancel the Seminar with less than 10 participants. For further enquiry please write to: lancianoguitar@gmail.com. ITALIAN AND INTERNATIONAL PARTICIPANTS (13 YEARS OF AGE AND OLDER) CAN BE ADMITTED TO EMF SEMINARS. PARENTAL AUTHORIZATION IS REQUIRED FOR THOSE BELOW THE AGE OF 18. TO ATTEND THE SEMINAR, IT IS NECESSARY TO COMPLETE THE REGISTRATION FORM AND SEND IT BY THE DEADLINE TO THE ADDRESS INDICATED. THE REGISTRATION FORM IS AVAILABLE AT www.estatemusicalefrentana.it OR ONLINE AT http://www.lancianoguitar.com. IT IS REQUIRED TO ATTACH TO THE FORM THE APPLICATION FEE PAYMENT RECEIPT AND THE OTHER DOCUMENTS LISTED. ADMITTED CANDIDATES WILL NEED TO PAY THE TUITION FEES BY JULY 20th 2017. ADMITTED CANDIDATES WILL NEED TO VISIT THE REGISTRATION OFFICE AS SOON AS THEY ARRIVE IN LANCIANO, BEFORE THE BEGINNING OF THE SEMINAR, TO RECEIVE ALL THE NECESSARY INSTRUCTION AND DOCUMENTATION TO ATTEND THE SEMINARS. ADMITTED CANDIDATES HAVE TO FOLLOW THE INSTRUCTIONS GIVEN BY FACULTY AND ORGANIZATION, BE ON TIME FOR THE CLASSES AND REHEARSALS, AND RESPECT THE TEACHERS, ORGANIZERS AND COLLEAGUES. MISCONDUCT CAN BE PUNISHED WITH CANCELLATION FROM THE SEMINAR WITHOUT REFUND. AUDITORS ARE ADMITTED TO THE SEMINAR. AUDITORS HAVE TO PAY THE REGISTRATION TO APPLICATION AND AUDITORS FEES. THEY CAN AUDIT THE CLASSES BUT CANNOT PERFORM IN THE FINAL PARTICIPANTS CONCERT. FULL PARTICIPANTS WILL TAKE PART IN THE EDUCATIONAL AND PERFORMING ACTIVITIES ORGANIZED WITHIN THE SEMINAR. 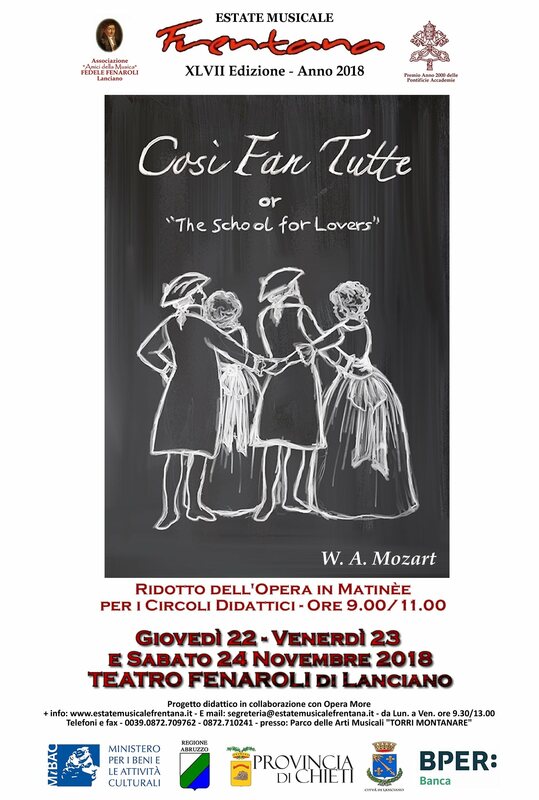 THEY WILL PERFORM IN THE CONCERTS ORGANIZED BY THE SEMINAR IN LANCIANO AND IN OTHER POSSIBLE LOCATIONS FOR THE EMF FESTIVAL. SEMINARS HOURS WILL BE SCHEDULED TO MATCH PRIVATE STUDY AND ENSEMBLE REHEARSAL. 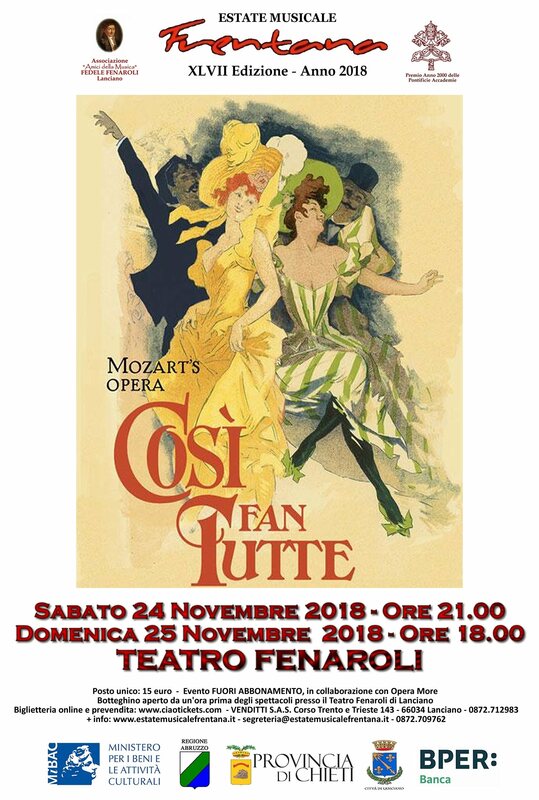 INSURANCE: "AMICI DELLA MUSICA" FEDELE FENAROLI ASSOCIATION GUARANTEES INSURANCE FOR ALL PARTICIPANTS AND AUDITORS, LIMITED TO ACCIDENTS THAT OCCUR DURING SCHEDULED EDUCATIONAL AND PERFORMING ACTIVITIES. AT THE COMPLETION OF THE SEMINAR, PARTICIPANTS WILL RECEIVE A CERTIFICATE OF ATTENDANCE. PARTICIPANTS WILL RECEIVE A CARD TO ALLOW FREE ACCESS FOR EMF CONCERTS DURING THE SEMINARS PERIOD. "AMICI DELLA MUSICA" FEDELE FENAROLI ASSOCIATION HAS THE RIGHT TO MODIFY THE RULES IN CASE OF NECESSITY. PARTICIPANTS WILL BE PROMPTLY INFORMED.